I must confess I don't know a lot about sewing machines, only that this seems a really good buy considering what it does, what it comes with, and the fact it has a 3yr guarantee all for under £60! If you want to find out more, watch the product video, but try not to laugh! Hold on to the receipt. I have had Silvercrest items fail in a couple months, and your guarantee is worth nothing without proof of purchase. Sounded great, but I bother with this. I had mineonly an hour and a half and took it back, the only stitch I could get it to do was a straight stitch and a zig zag, you'd better off getting a more basic model from a bigger brand. I was very disapointed with it :(. 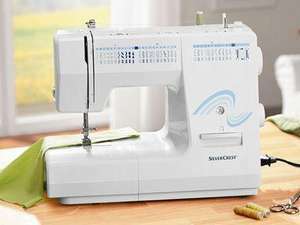 I have had the silvercrest 8750 sewing machine for some time , very pleased with the product, easy to use and lots of functions to play about with. Only thing is I need to replace my pedal and lead , due to a a house clearance It may have been thrown away by accident. I have been on ebay and many site to replace , some say compatible with most machines and dont want to take the risk of purchasing the wrong product. If anybody could help to point me in the right direction i would really appreciate it. spoke to my local sewing machine shop any they say never heard of Silvercrest and cant help. Do I have to buy a new machine just to replace the pedals and lead, as i also think this would be difficult, as this brand is not sold in many places I know of. Why not try Lidl H/O. and ask for customer service. If anyone can help, they should!